SeithCG » Here’s my camera rig! Home > production, update	> Here’s my camera rig! Alright, I’ve released a preliminary version of my camera rig and the GUI that goes with it! Please carefully read the documentation and installation notes on the page prior to using it. You’ll find everything here. Enjoy! Wow, this thing is sweet… makes me feel like I’m really making a movie…… Although I have no idea how to use it yet… but it looks neat in the scene!! WHAT ABOUT A OSX VERSION….THE RIG LOOKS GREAT..
Tim: He he, yeah it’s in fact purely cosmetic! Does this rig only work with a Mac? Eric and Ryan: I believe the rig should work on a Mac (can not confirm though). If you can’t open the rig scene, your problem might be your Maya version rather than the OS. If it is the case, I explain how to fix that at the top of the shotCam page. Regarding it working on OSX, it may not work on some systems, depending on how the hard drive is named. If that’s the case, well then I’ve gotta reformat my drive to test drive the script, which I probably won’t do right away (grin)! If anyone’s got a work-around, I’d love to hear it. Regardless, thanks for the rig. 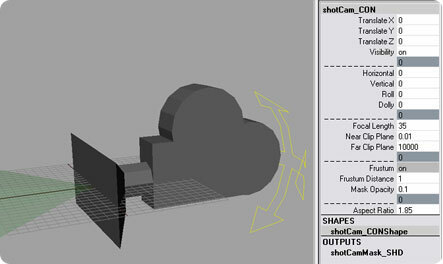 Barry: Since I don’t have access to a Mac I can’t verify this but please do something for me: just import the shotCam.ma file in Maya manually (File->Import) and look in the script editor. There you should see precisely what Maya did to get the file. Most importantly that will tell you exactly what the path is. And this is what you should write in the script itself at line 25. Let me know how this works. I did a quick peek inside the script to find the offending line and but no obvious solution jumped out at me. I may have some time over the weekend to investigate more. Thanks again for the script and for answering questions. Cheers. hey this is a fantastic setup! I am very interested in getting it going on the Mac as well. I know a little MEL but I don’t think I know enough to fix this problem. I may give it a few more goes to see if I can come up with somethings. Yea, I’m getting that same error as Andrew in mac as well. Any chance or guidance on how to add 1.77 to the aspect ratio list? Any luck or chance to look at the window layout setup yet? Please let me know, I am definitely willing to do some testing. I´ve tried your shotCam and it´s a nice camera rig indeed! Hope you could test it and would be awesome your opinions for future updates. Another ruff layout sequence! Two sequences to go…!